Tired of debugging your regular expressions ? Do you want to quickly build efficient regexps ? 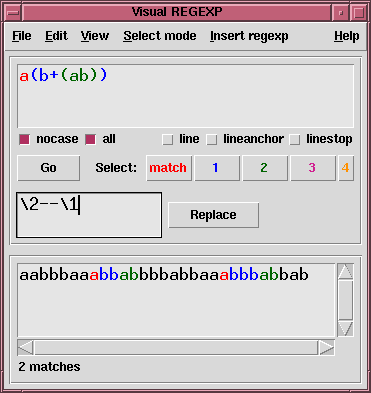 Visual REGEXP is for you ! 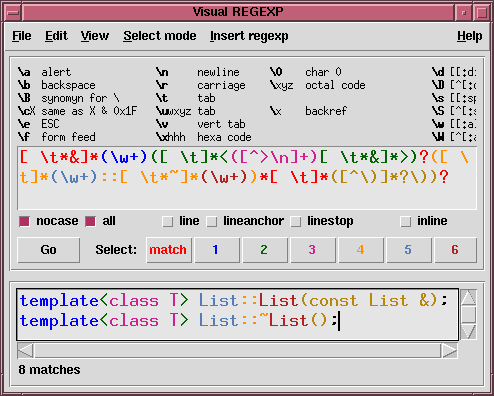 This software will let you design your regexps by letting you type the expression and visualize its effect on a sample of your choice. To following executable is a standalone program. Just download it, and run it! See the README file for some informations. 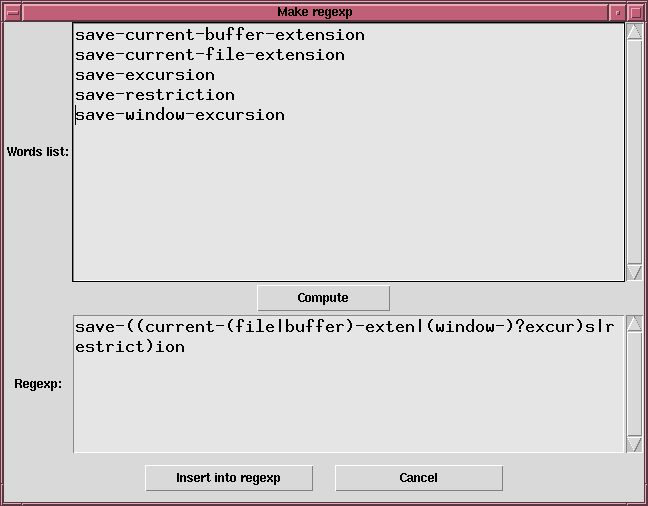 User get customize the program by adding a file visual_regexp.ini in the same directory as the executable. Here is a sample of such a file showing all the parameters the user can modify. In order to run this program, you need to have Tcl/Tk 8.3.0 (or later) for version 3.0 or Tcl/Tk 8.5a4 for version 3.1 installed (click here to download it). To get the version of an already installed version of Tcl/Tk, run 'wish' and type 'set tk_version'. User preferences : Some preferences (colors, geometry) can be modified by editing the script and changing the value of the variables (see comment to get variable meaning). some regexp can consume a lot of CPU time. This seems to be caused by the use of -all, -inline and -indices flags together. when a subexpression is not matched (empty match), the last character of the previous match are coloured. This is due to a problem in Tcl (bug submitted to Scriptics). 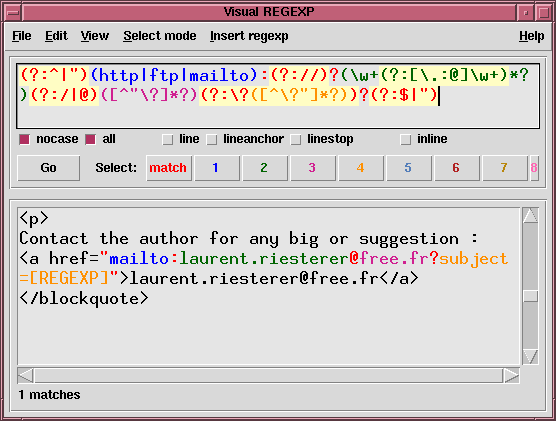 The best tutorial on regexp in this article written by Jan Borsodi, author of the Regexplorer tool which does the same job as VisualREGEXP. An other nice tutorial from Microsoft here. Future I welcome your suggestions ! (2006-03-07) -- new version done by Martin Lemburg. Many thanks, Martin. -- the key bindings inside the regexp text widget changed a bit to allow for expanded regexp (-expanded or (?x)) to contain tabs and newlines. Tabs are created with Control-Tab and newlines with Control-Return. Additional with Control-C|V|X (not c|v|x) it is possible to use the clipboard like with Control|Shift-Insert, Shift-Delete. (2002-09-01) -- Bugfix: parsing of command line when file name contained spaces was incorrect. -- A nice tutorial here. A special thanks to Luciano Espirito Santo for bug report and a lots of ideas. (2001-04-12) Bugfix: the line option when not properly handled when using replace. New options to save the sample text (useful for small in place text manipulation). New format (.tar.gz) to show that the program can be run directly. New README file to explain how to use the program. Support for user predefined regexps. 1.2 Distribution as gzip-ed file to avoid conversion problems between DOS/UNIX. Support for replace function after matching the sample. Correction of a few typos in the help text. 1.1 Correction of a bug in handling non-reperting subexpressions.